Hi Everyone and Happy Black Friday! As you read this, I will be running around Walnut Creek looking for fun Christmas presents for my Friends, Family and me! he he Since Thanksgiving is over, I think it’s the official beginning of the holiday season! So to kick off the holiday season I have a drink for you!! I totally had fun playing around with dressing the photo’s. It looks cold doesn’t it? Well maybe you need to warm up to a nice hot Eggnog Latte. 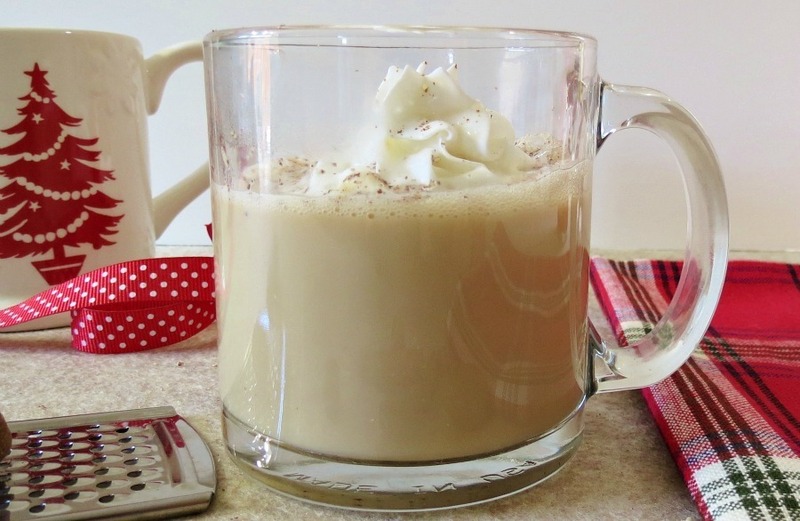 The eggnog latte is made with lite eggnog, skim milk and stevia. I whipped it together on the stove, and poured my mixture into a cup of hot freshly brewed coffee and gave it to Jenny before she went to school. I’ll be completely honest with you, I am not an eggnog fan! I tried it last year and I tried it again this year and I am just not a fan! However my family goes bonkers for the stuff! My Husband asked me to make homemade eggnog and after looking at the ingredients, I thought, nah! They can just buy it themselves. But I did get an honest opinion for the latte from Jenny. One thing about family, they are pretty honest. No one cares about saving your feelings. Sometimes I think were all a little to honest! Anyway, I asked her what she thought and she said it tasted so good. She told me she is picky about eggnog and she loved the drink. She told me I needed to put it on my blog! So there you go an honest opinion! I’m glad it turned out! 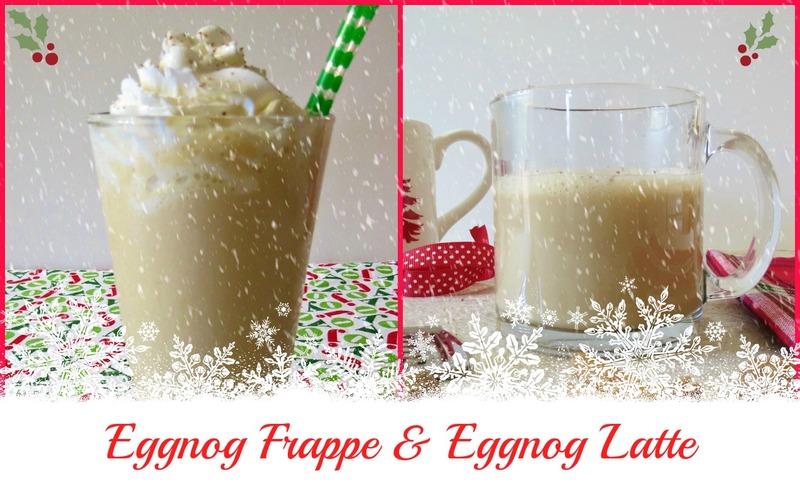 I do have lot more eggnog recipes to share with you this holiday season, but I can’t make them till someone is home to test it because I am not the best tester for anything eggnog!! 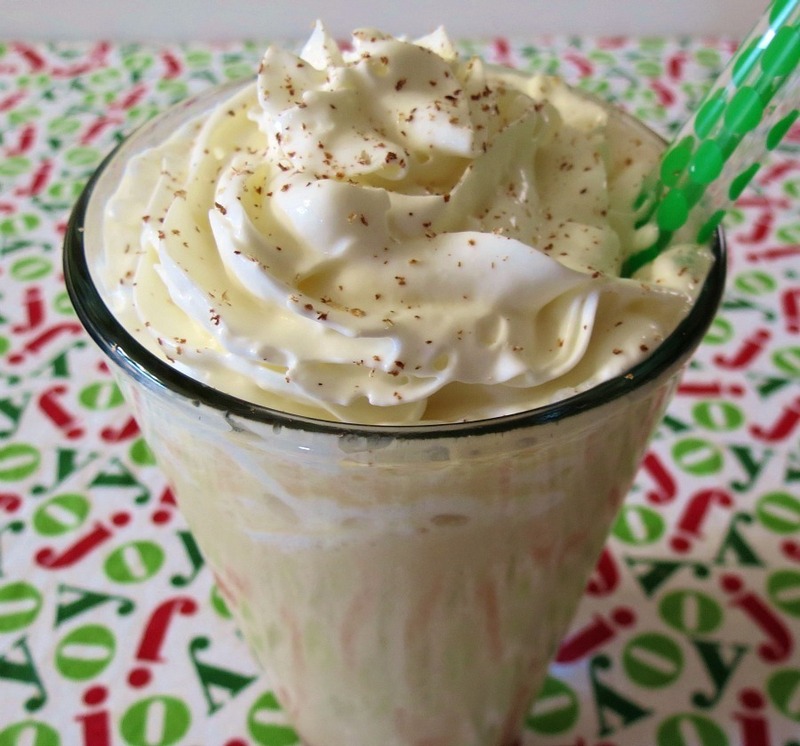 The Eggnog Frappuccino is basically the same recipe as the latte, but chilled. It’s made with lite eggnog, skim milk and cold strong brewed coffee. I put it all together in my blender with a few ice cubes and presto I have a nice cold frappuccino. Delish!! Well according to Jenny it is! For me, I’ll stick to my Peppermint Frappes! They are my favorite drink right now!! Now my Starbucks comparison to the latte. Well let’s see here, it seems were kind of close in some categories. Mine is fewer calories (by almost 70), less fat (more than half), a little less carbs and sugar. So I think mine is better! I like the less fat!!! 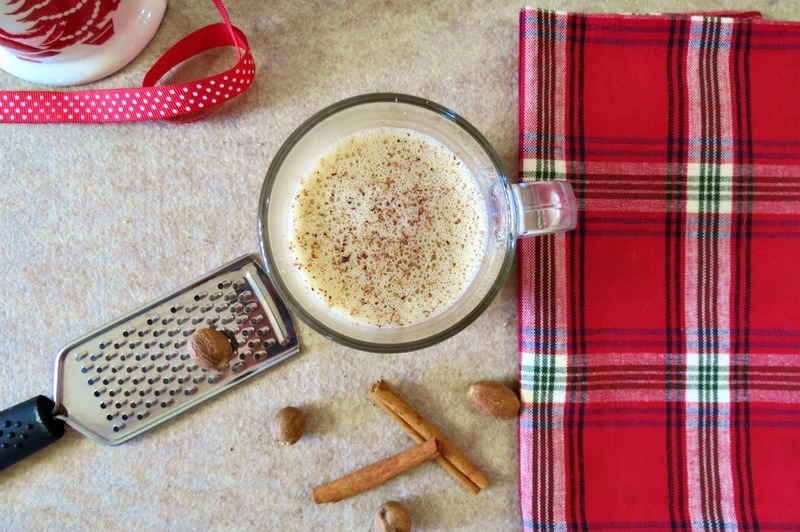 A hot holiday coffee drink made with lite eggnog, milk and espresso topped with a sprinkle of nutmeg. In a small pan, add eggnog, milk and sugar. Whisk together until heated and frothy, about 2 - 3 minutes. Pour into mug with coffee. Ok, now that we did the latte, lets see how we did with the frappe. Well mine is less in all categories except protein and you want more protein, so I win! ha ha Sorry my favorite coffee house, but I won this one!!! 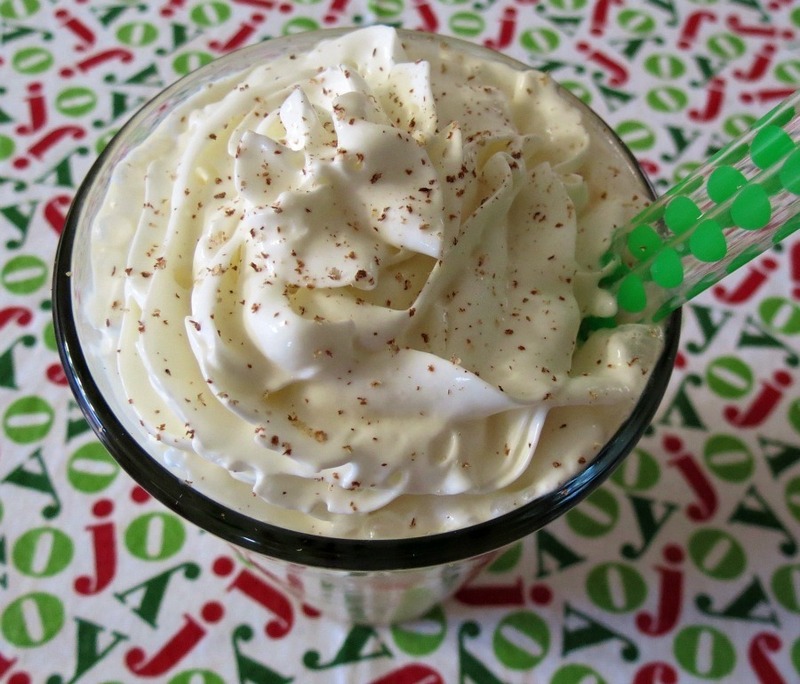 A cold holiday coffee drink made with light eggnog, milk and topped with whip cream and a sprinkle of nutmeg. In a blender add all the ingredients except for your toppings and process until smooth. Pour into a cup and top with whip cream and nutmeg. Hmmm, do they make a fat-free eggnog? I’ll have to look into that! If you know, let me know! Until then it’s time for me to go, time to make dinner before my Husband gets home. I’m excited to make the Eggnog Latte for him tonight. I think he will be impressed!! Have a lovely Friday!! Hope it’s not to crazy and hectic for you! P.S. My question for you today is, Do you like Eggnog? My husband would LOVE this! Think ill surprise him with it sometime this weekend! Thanks for sharing! Love Eggnog! And, I love Walnut Creek! I used to leave there…now I live in the Carolina’s; oh I miss me some Walnut Creek Shopping!! That’s funny Mom used to live right near Walnut Creek and now she lives in North Carolina! I LOVE eggnog!!! I can’t wait to try the frappe with some rum in it. Let me know what you think of it, if you try it!!! Perfect holiday drink, Jen…and a light version is really appreciated today! 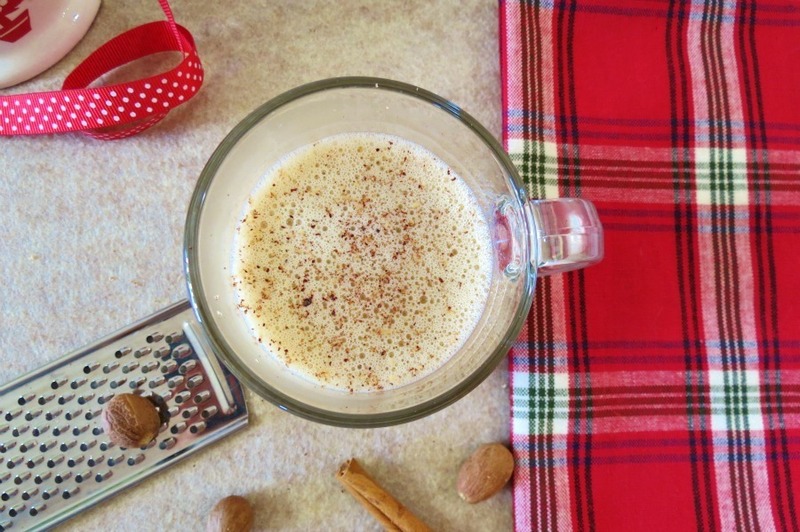 Eggnog always tastes way too rich to me but I bet this lightened up version would be super perfect! I think that’s why I was never the biggest eggnog fan! It’s to rich for me too! Eggnog is definitely my favorite holiday drink!! These photos are making me drool – your photography is gorgeous! !